Nope, this is not a philosophical discussion. A tree did fall in the woods, sortakinda. It did make a noise as it took out our satellite dish and hit the roof. I don’t know why it picked that moment to fall. I had been outside and a wind of that sort would have made itself known. But fall it did and in case you were wondering it made a pretty loud noise as it hit the roof. The thickest part of this limb is probably 5 inches in diameter. Our neighbor (also Son in Law) Kelly was nice enough to go up on the roof and look for punctures. He slid it off the roof to the position you see here. Turns out, it wasn’t the only one to fall in that timeframe. This is right in the middle of the goats domain. This small tree had been nice enough to serve double duty. 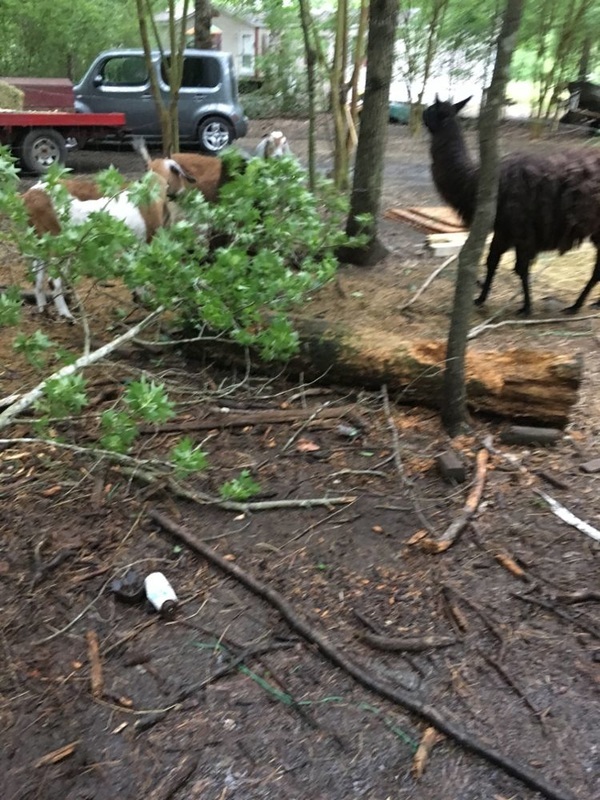 It was both a tree and a fence post but as we were leaving for an appointment in the morning we noticed one of the goats chewing on fresh bark. That bark had been pulled loose when the tree trunk snapped. For those in the medical field who may be reading (get back to work) it was a perfect greenstick fracture. Half the trunk was intact but it was torn on one side. The part still remaining was holding it up and it was leaning against the main power line to the house. I said a little prayer that it wouldn’t get heavier than it was and we left for our appointment. When we got back home I took a “come-along” and started pulling it away from the power line. In this picture it was leaning to the opposite side and I felt sure it wasn't going to take out the power line. The reason for the slack in the line is that I had begun to use my chainsaw just above the cut. I cut most of the way through the trunk and put more stress on the come-along. It snapped again and stuck itself into the ground while I was cranking it down. I figured there was some reason for optimism. 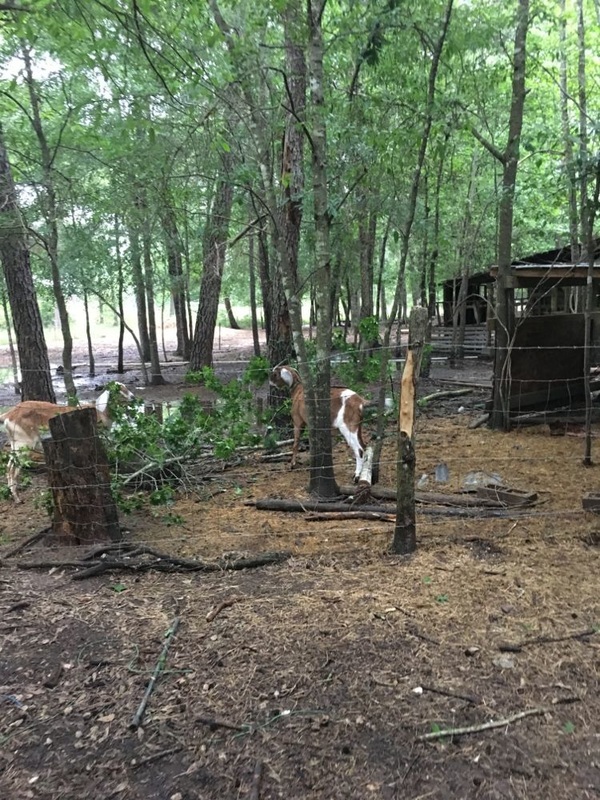 I realized from the direction it was leaning now that it wouldn’t wipe out the goat shelter or a bunch of fence. Problem was that even though it had snapped it's neighbors were holding it up. It occurred to me that there was still a need for caution. Even a stopped clock tells the correct time twice a day. 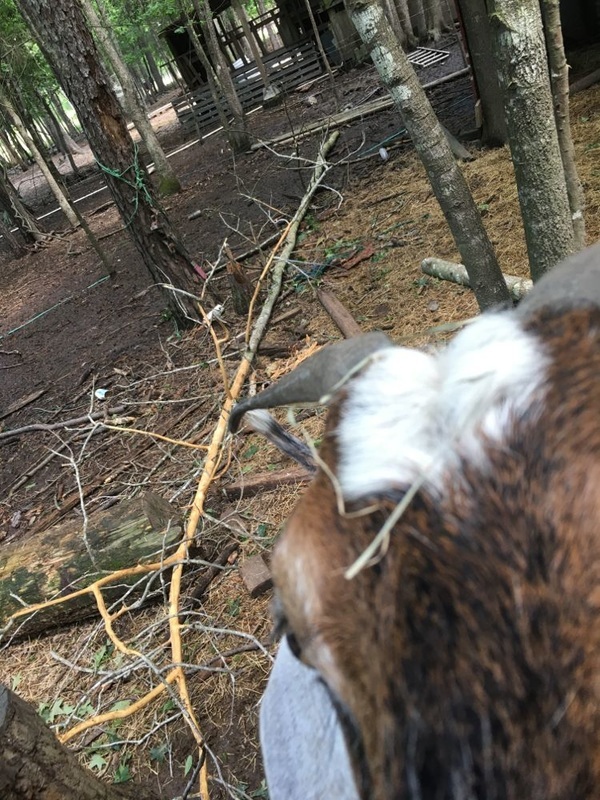 This is the view after I repeated the process and the tree had been converted from a hazard to goat food. It’s not a problem to take down a tree. It is a problem when it’s neighbors hold it up and that’s what happened here. They were not easily talked into letting it fall. After cutting through it twice it became manageable for one in my current (old and fat) physical condition. Everybody joined in. I was reminded of a dvd I presented once in science class. I do not recall if it was from the Planet Earth or the Blue Planet series. A whale had died and there were pictures of the process where the whale was ultimately reduced to a skeleton with crabs feeding on the small pieces of meet that managed to still hold fast. It provided different feed to different species on it's trip from the surface to the bottom. Perhaps you can see from this second day picture which my caprine companion photobombed just why I felt that way. The leaves went immediately and the smaller twigs have started to go as their bigger brethren lose their bark. It's won't be long before I am cutting up what is left for the burn pile. Not meant to be a lumberjack.